In 1896, Don Jose Ruiz-Berdejo began cultivating grape vines on his estate, Nuestra Senora de la Esperanza (Our Lady of Hope), located right outside of Jerez de la Frontera. Once the wine was made, Jose would store the barrels on his estate and later sell them to a large exporting company. By the 1950’s, Jose’s son-in-law, Don Emilio Lustau Ortega, offered a new more innovative vision for the Bodega. Foreseeing a strong and expansive future, Emilio moved the bodega to the ancient Santiago district in the heart of Jerez. This location not only allowed Emilio to commence the first stage of expanding the bodega, but it was also was a strategic relocation in order to join a select group of Sherry exporters. His idea was wildly successful, and two decades later, Emilio took the profits he gained with this new partnership and further expanded the bodega to include two new cellars on the old family estate, Nuestra Senora de la Esperanza. One could say that the name of their old family estate may have been an omen for the bodega, but Lustau’s luck never seemed to run dry. By 1980, Bodega Emilio Lustau came under the new, fresh and innovative management of Rafael Balao, who established a collection of Almacenista Sherries. These Sherries were drawn from rare wines held by stockholders and offered to very select and distinguished set of customers. 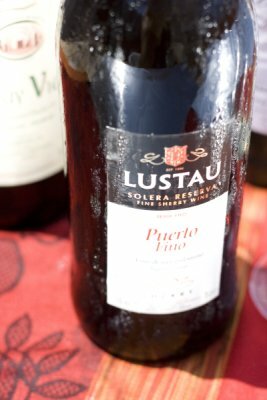 The Lustau Solera Reserva Sherries, a range of old Sherries drawn from stocks of wines held by Lustau since its inception is just one example of his creation. Rafael also revived the East India Solera, which blended full bodied sweet sherries through a process of maturing the casks of wine in a warm, humid environment. The continual success of the Bodega soon caught the attention of Luis Caballero SA, owner of El Puerto de Santa Maria Sherry and Spirits. Luis became a large shareholder of the company, providing the financial wherewithal for the Bodega Emilio Lustau to expand, incorporating 170 Hectares of Albariza. With Luis Caballero’s involvement in Bodega Emilio Lustau, however, there has been an emphasis on Fino Sherries. Therefore, all the Sherries that were once under Caballero SA are now under Lustau, which includes a large number of Puerto Fino stocks stored at El Puerto de Santa Maria. These stocks, in conjunction with Caballero’s desire for innovation, have led to the creation of a Double Flor system of refreshing the wine just before bottling. Consequently, the Fino wine preserves its freshness in the bottle, tasting as if it’s still in cask. From the photo and your tasting description, this was definitely an out-of-condition bottle. Puerto Fino usually has the typical ultra-pale fino colour, and a nose that shows lots of character but no oxidisation. If you still have the bottle, you can verify the age by decoding the lot number (letter L followed by 4 numbers) ink-printed onto the backlabel. The first number denotes the year, the subsequent 3 numbers the date of bottling…eg “L6155” denotes bottling on the 155th day (ie 4th June) 2006. Every Sherry Winery typically has a code specifically for their sherry wines located on the back label. The good news is that it ensures freshness, which we support wholeheartedly. The bad news is that you may have to email/call the winery to find out the code, because it typically is not listed on their website. Granted, it would be convenient for there to be a standard system so that we wouldn’t all need a Sherry Wine Secret Decoder Ring, but this is not the case. If you find yourself having problems in the future decoding your bottle sherry, don’t hesitate to let us know. We’ve included our notes below to the sample of Puerto Fino we received last night. Enjoy! Light in color, the nose is so complex and enjoyable I find my nose at the glass more than my lips. Nutty raw almond notes, combine with honeydew, sea breeze, buttercups(flowers), and fresh air! Delicate in the mouth while at the same time a bit zingy with a vibrancy that reminds me of a cold shower. White flowers, salted melon, and the sensation of fresh crush nuts mixed with the flor that protected the wine for so long. This wine is very enjoyable and the finish lingers in your mouth for what seems like forever. Light colored with a nose that is not so surprisingly better than the last bottle we had which was oxidized. The bouquet was so layered that I had a difficult time distinguishing between aromas of sea salt, melon, lime popsicles, green apple and almond. The mouthfeel felt a little like poprocks spring to life in my mouth slowly settling to a buttery mouthfeel. I tasted lots of lemon-vanilla ice cream on the palate followed by cashews, butterscotch, white/yellow flowers and salt. Really a fun wine that made me realize I am turning to the dark side and becoming a young sherry wine lover!